The French statesman, writer, and philosopher, Louis Vicomte de Bonald belongs to the theologist school of the Traditionalists. 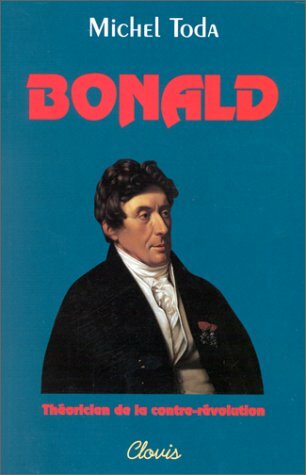 Bonald was born on October 2nd, 1754 at Monna, near Millau a town in the Rouergue region (Aveyron) of southern France, into an aristocratic family. He studied at the Oratorian Collège de Juilly. As an aristocrat, military service was expected, so in 1773 he joined the king’s musketeers. The musketeers were dissolved in 1776 by Louis XVI, thus freeing Bonald of his military duties. So he returned to his own province, where he became involved in public affairs. He was elected mayor of Millau in 1785, and in 1790 chosen member of the departmental Assembly for Aveyron. During the early phases of the French Revolution he directed his efforts at the local and regional level to maintain order. Even after the National Assembly abolished the aristocracy, Bonald was reelected as mayor and then elected to the departmental assembly. The turning point in Bonald’s relation to the Revolution came with the Civil Constitution of the Clergy, which subordinated the Catholic Church to the new national government. Bonald believed it wrongly stripped the Church of its position in society. By refusing to force the clergy to take the oath of allegiance, Bonald disqualified himself from holding public office, though he was still largely supportive of the Revolution. By October 1791, however, Bonald had joined the counterrevolution and had emigrated from France. Hoping to overthrow the Revolution from without, he became a soldier in the army of Condé, and, when the army was disbanded, retired to Heidelberg, where he took charge of the education of his two elder sons. Bonald published at Constance, in 1797, his first work: Théorie du pouvoir politique et religieux, which was suppressed in France by order of the Directory. In 1797 Bonald returned to France under the name of Saint-Séverin, and published Essai analytique sur les lois naturelles de l’ordre social (1800); Du divorce (1801); and La législation primitive (1802). He also collaborated with Chateaubriand and others in the Mercure de France, contributing several articles which were published in book form with other studies in 1819 under the title Mélanges littéraires, politiques, et philosophiques. His hiding continued until 1802, when he received a pardon from Napoleon. Later, Bonald entered the Napoleonic government, serving on the Great Council of the Imperial University. In 1808 he declined to be a member of the Council of the University, but finally accepted in 1810. He refused to take charge of the education of the son of Louis Bonaparte, King of Holland, and of the King of Rome, the son of Napoleon I. After Napoleon’s abdication in 1814, Bonald quickly joined the restoration monarchy of Louis XVIII. A monarchist and royalist by nature and by principles, Bonald welcomed the restoration of the Bourbons. He was appointed a member of the Academy by royal decree in 1816. He was elected to the Chamber of Deputies, the lower house of the national legislative body. From 1815 to 1822 he served as deputy from Aveyron, and in 1823 became a peer of France. He then directed his efforts against all attempts at liberalism in religion and politics. The law against divorce was proposed by him in 1815 and passed in 1816. He took a prominent part in the law of 1822 which did away with the liberty of the press and established a committee of censure of which he was the president. In 1815 he published his Réflexions sur l’intérêt général de l’Europe; in 1817, Pensées sur divers sujets in 2 vols. 8 vo. (2d., Paris, 1887); in 1818 Recherches philosophiques sur les premiers objets des connaisances morales; in 1827, Démonstration philosophique du principe constitutif des sociétés. Meanwhile he collaborated with Chateaubriand, Lamennais, and Berryer, in the Conservateur, and later in the Défenseur founded by Lamennais. Bonald continued to serve under the next monarch, Charles X.
Bonald refused to serve under Louis Philippe, who had come to power in the Revolution of 1830. In 1830 he gave up his peerage and withdrew to his country home to lead a life of retirement in his native city. — “There is not to be found in the long career,” says Jules Simon, “one action which is not consistent with his principles, one expression which belies them.” He died in Paris, 23 November, 1840. A number of thinkers have endeavored to comprehend the nature of modernity. Their analyses differ, but many thinkers agree about key points on the road to modernity: the Renaissance, the Reformation, the Scientific Revolution, to name a few. To understand the modern world one has to examine one of those periods: the French Revolution. To some, the Revolution heralded political liberalism with cries of “liberté, egalité, and fraternité.” To others, the Revolution signified the rejection of the West’s heritage of the past two millennia. As the Revolution was occurring, a number of thinkers sensed its challenge to the old order (not only politically, but more importantly, philosophically). Louis De Bonald described the political problems of the Revolution. In doing so, however, he also developed a theory of language, interrelating with his theory of government. According to de Bonald, man is essentially a social being or, as Aristotle said, a zoon politicon. His development comes through society; and the continuity and progress of society have their principle in tradition. Since language is the instrument of sociability, speech is as natural to man as is his social nature itself. Language to Bonald meant the entire system of communication, not only words but syntax and relation of words. Man cannot think without language. Hence, language could not have been discovered by man, for “man needs signs or words in order to think as well as in order to speak”; that is “man thinks his verbal expression before he verbally expresses his thought”; but originally language, in its fundamental elements together with the thoughts which it expresses, was given him by God His Creator (cf. Législation primitive, I, ii). This thought is the basis for Bonald’s claim that language ultimately had a divine source. This claim rests upon his argument that if thought and language are co-dependent, one cannot begin without the other. Then to start the language process, some outside idea is necessary. If this is the case, language serves as a type of apologetic for the existence of God as the originator of language. Such an apologetic would not be airtight, and it might only demand a deistic first cause. Still, it is a large and important claim. The evolutionist claim is that through chance developments over time, the appearance of design can develop. To evolutionists, the evolution of language fits nicely into their account of the evolution of life and perception. The above mentioned fundamental truths, absolutely necessary to the intellectual, moral, and religious life of man, must be first accepted by faith. They are communicated through society and education, and warranted by tradition or universal reason of mankind. Society, state and law are of divine origin and therefore subject to religion and the church. There is no other basis for certitude and there remains nothing, besides tradition, but human opinions, contradiction, and uncertainty (cf. Recherches philosophiques, i, ix). From Euro-Synergies , October 12, 2009.